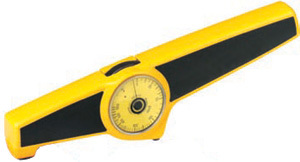 A robust metal case houses the precision measuring system. Resistant to mechanical shocks, acids and solvents. The measurement of the coating thickness is dependent on magnetic attraction. The attractive force is related to the distance between a permanent magnet and a steel substrate. This distance represents the thickness of the coating to be measured. The magnet is lifted from the surface by means of a spring connected to the magnet arm. The spring is tensioned by means of the thumb wheel and the coating thickness is shown directly on the scale. Minimum Surface: .8" dia. 1.2" dia. 1.2" dia. 2" dia. 4" dia. .6" dia. Min Base Thickness: .040" .040" .060" .060" .080" .200"
Four Standards mounted on cardboard. Non-magnetic coating on steel. Each 1-1/8" square. 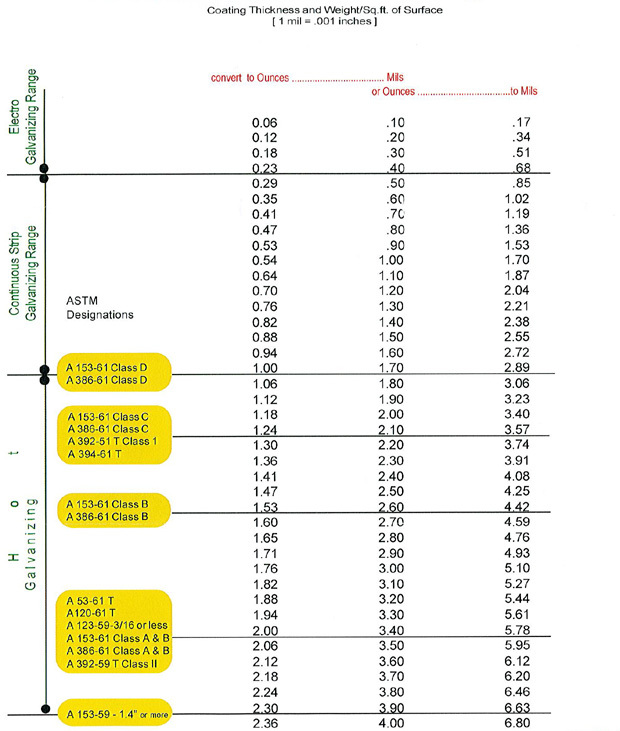 Coating thickness standards for controlling the gauges. Note: Available with NIST Certification. Add /C to the part number and $150.00 to the price. No more need for conversion charts or calculations. Min Area: .8 inch dia. 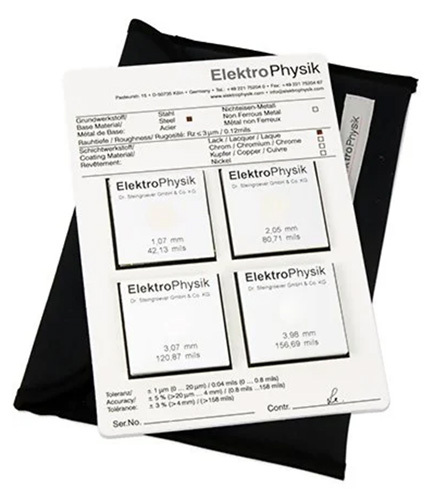 For measuring non-magnetic materials over steel. 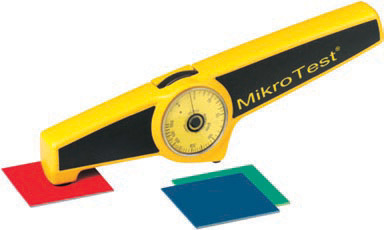 Mikrotest ZnFe - For measuring electrolytic & Hot Dip Galvanized over steel. All new gauges are certified. The above price is for used gauges to be re-certified.